A few weeks ago I went to a local consignment sale and found so many wonderful resources for great deals! There were thousands of books and tons of teaching supplies! One of the items I picked up was this set of shape manipulatives. They came in red, blue, and yellow in a variety of sizes. Some shapes are big, some are small, some are thick, and some are thin. I love the variety! We have been looking at shapes and really focusing on the four basic shapes: rectangles, triangles, squares, and circles. This set was perfect for our shape study. I cut out shapes in construction paper and wrote the shape words on them. Then, we worked on sorting by shape. How could else could I use shape manipulatives? Happy Monday! We are still working on shapes, so I wanted to share this easy Shape Hide & Seek game with you all. 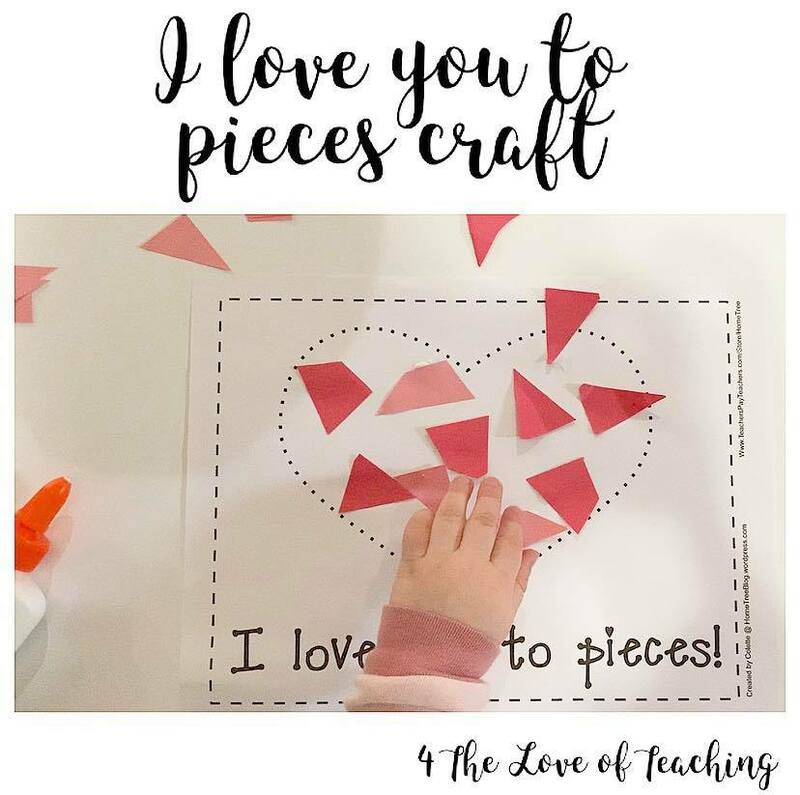 Last week, I shared that I cut felt shapes for a DIY puzzle and used them again for a giant shape puzzle. We used those same felt shapes again for this activity! 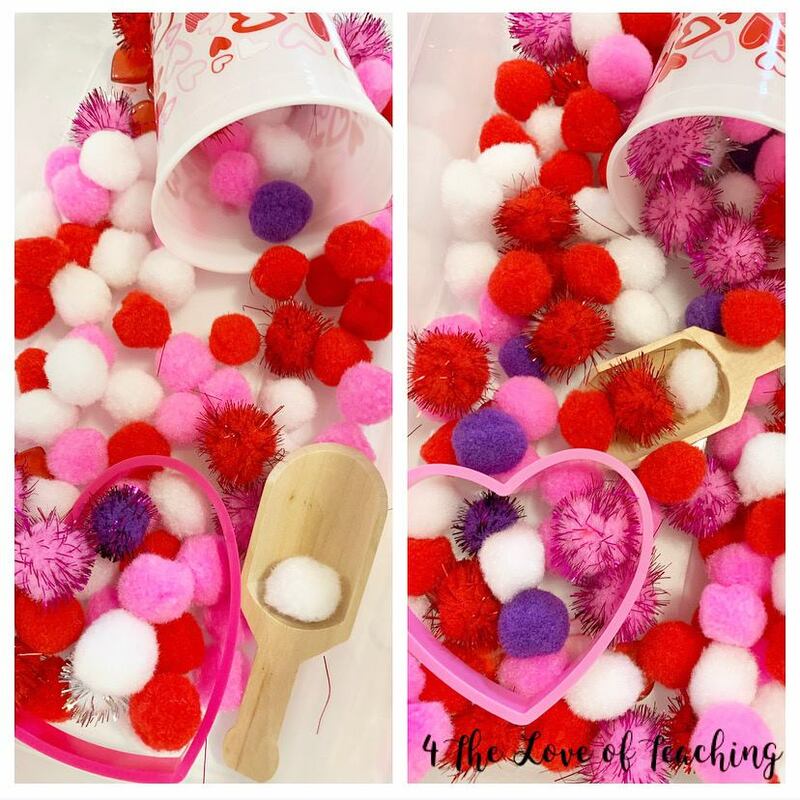 That's three activities you can do with those felt shapes! We haven't played hide and seek much, so I wanted to make sure all of our shapes were visible so that they understand the basics of the game. Find the shape and match it to the DIY puzzle. Eventually we will move towards hiding the shapes a little more, but I didn't want it to be frustrating in any way at first. This also works on visual skills as well - looking vertically and horizontally for a given object. You could also hide your shapes in a bigger area (maybe a specific room), but I wanted to keep it simple for this activity! You can play hide and seek with SO many objects/themes! The options are endless and it's great practice leading up to Easter egg hunting! We've had this Melissa & Doug puzzle for a while and I love that not only can you work on shapes, you can work on colors with it, too. I saw on Fun with Mama blog that she used this puzzle for a fun Shape Hunt Sensory Bin, so we recreated it using black beans. The beans were less than $1 and it took less than two minutes to throw this together. Literally just dump a filler (you could use rice, too) and added the shapes. Before the activity, I hid the shapes under the beans. Once they found a shape, we talked about what shape it was and they placed it in the puzzle. 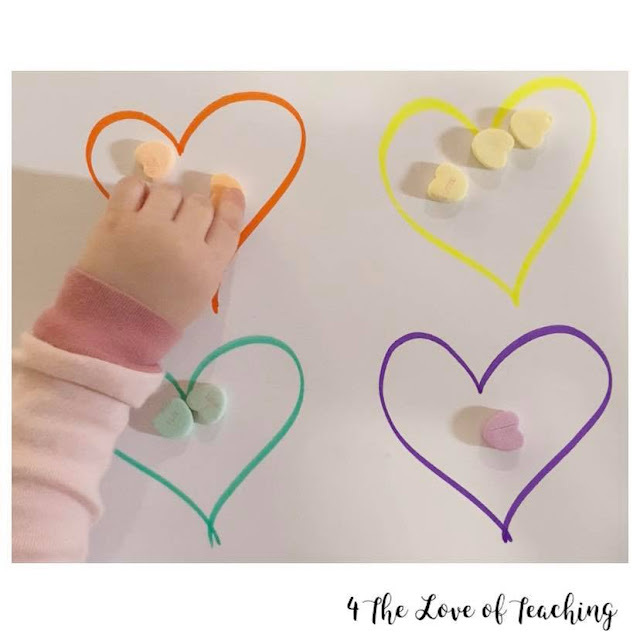 My little ones really liked this activity and played with the beans for the longest time (with and without the shapes)! A fun way to work on shapes is in the BATH, so we had a "Shape Bath" last night! I bought two packs of sponges and cut them out in the four shapes we are working on right now: circle, square, rectangle, and triangle. 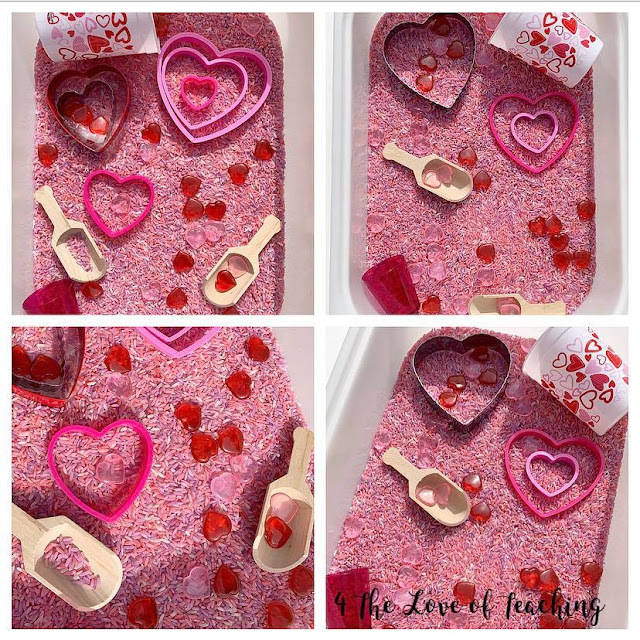 I took out all of our toys that we have in the bathtub for this activity and placed the shape sponges in the tub! First, I let them just freely play with the sponges. They put them on their heads, squeezed water out, etc. After some time we worked on identifying shapes (I asked them if they could find a circle, etc.). 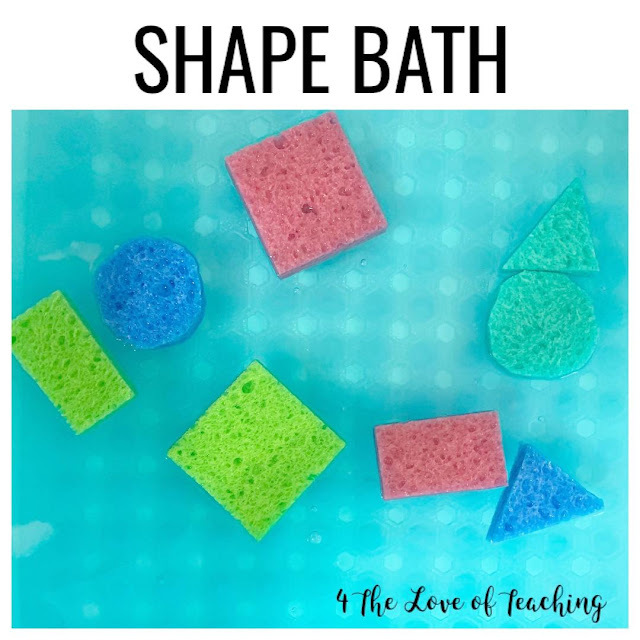 Such a SIMPLE way to incorporate shapes into bath time and they really enjoyed a simple "toy" to play with at bath time! Yesterday I shared a DIY basic shape puzzle that I created using a cardboard box and felt pieces. We used those same felt pieces to create a GIANT shape puzzle! All you need for this activity is white paper (THIS is the kind we use). I taped the paper to our coffee table and outlined the shapes. This activity took only a few minutes to set up and served its purpose! It isn't something we will keep for long (lets be real - someone ripped the corner in less than a few hours! ), but it worked for that days activities and can be easily created again! And I love that I was able to use the SAME felt pieces we'd been using! We are in the beginning stages of working on shape identification, so I wanted to share this very basic DIY shape puzzle. 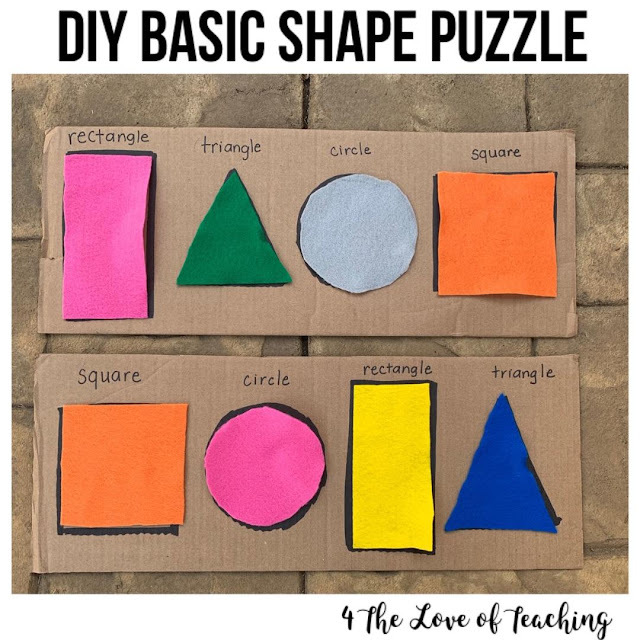 So many shape activities and puzzles include multiple shapes and I really felt it would be beneficial if we began our focus on the four basic shapes: square, circle, triangle, & rectangle. I created this DIY puzzle using two pieces of a cardboard box (thanks Amazon!) and felt pieces. I would suggest using a sturdier piece of felt than I did here, but this works for its purpose! 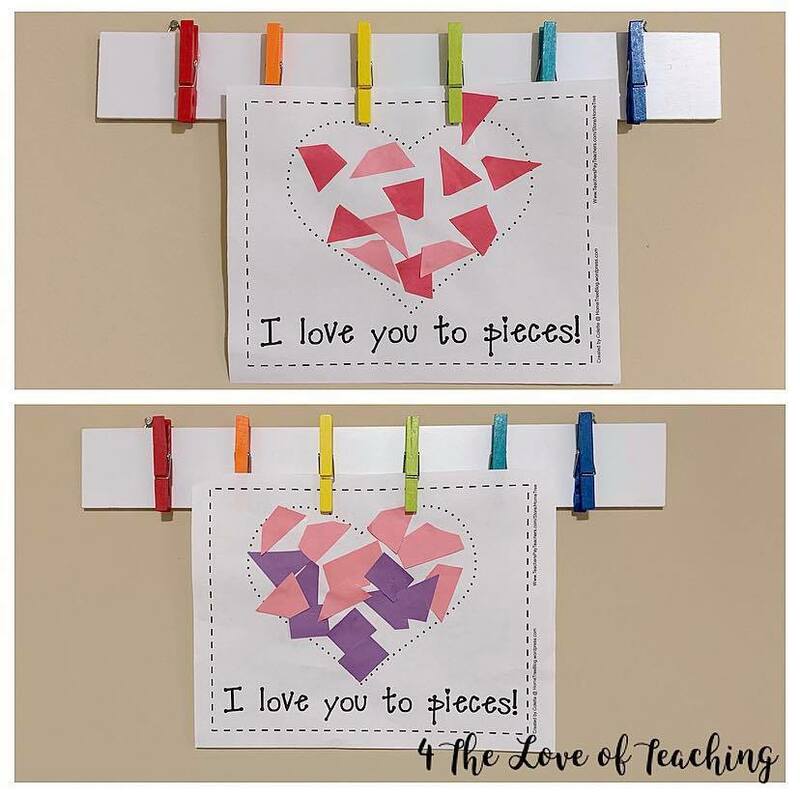 You could also add velcro which would help the shapes stay in place. I have lots of fun shape activities planned and will be sharing lots here! 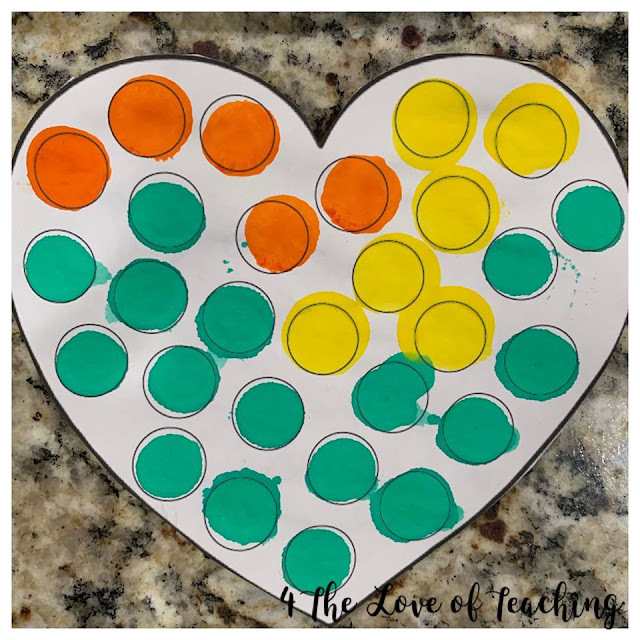 We work on visual scanning quite often, so I thought I would share this easy activity for working on visual scanning skills. One easy activity is to use a book with various pictures to "find" certain objects. "Where is the cat? Where is the dog? Where is the banana?" etc. My little ones LOVE this book, but when I would hold it up they would see two pages at a time and that can be visually distracting. So, I ordered a second copy from Amazon and used a box cutter to cut out each page. Each page varies in the number of objects, but overall it's much less visually distracting! I'll hold up each page and ask them to find certain objects. For older kids, I would suggest the Look & Find Books, Where's Waldo, etc. Happy Valentine's Day! Today is our last Valentine's themed activity. 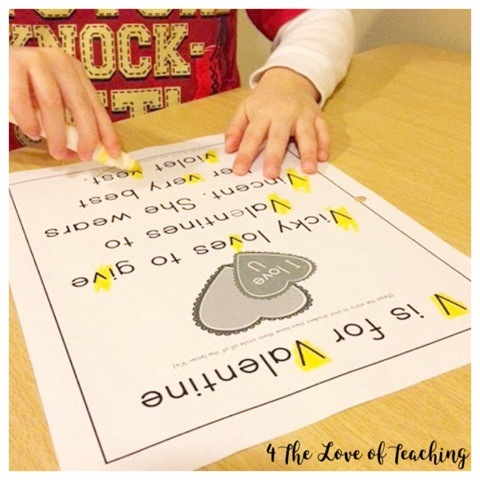 This activity is so easy to prepare and is a great way to work on gross motor skills. First, I placed the hearts around the room and had my littles run to the colored heart I called out ("Run to pink! Run to orange!"). Then, we added in jumping on various hearts. Next, we placed the hearts in the sequence you see below and jumped from one heart to the other. After that, I just followed their lead and we did several other activities with them. One girl lined the hearts up in a row and jumped from one to the other. Then, she would tell her sister "Jump to pink. Jump to blue, etc". 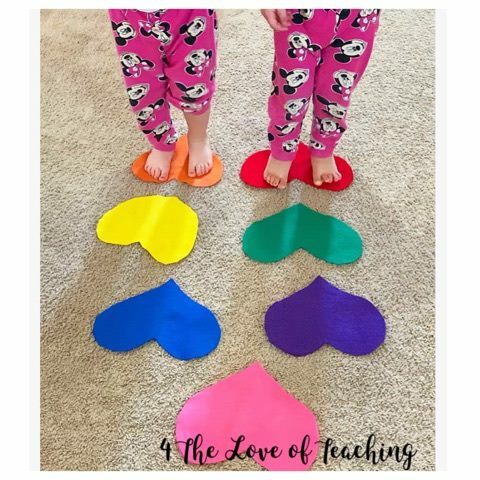 This was such an easy way to work on gross motor skills! I created with a Valentine's theme in mind, but will definitely keep this activity as a regular rotation! I love that you can work on various gross motor skills AND add in some color identification! 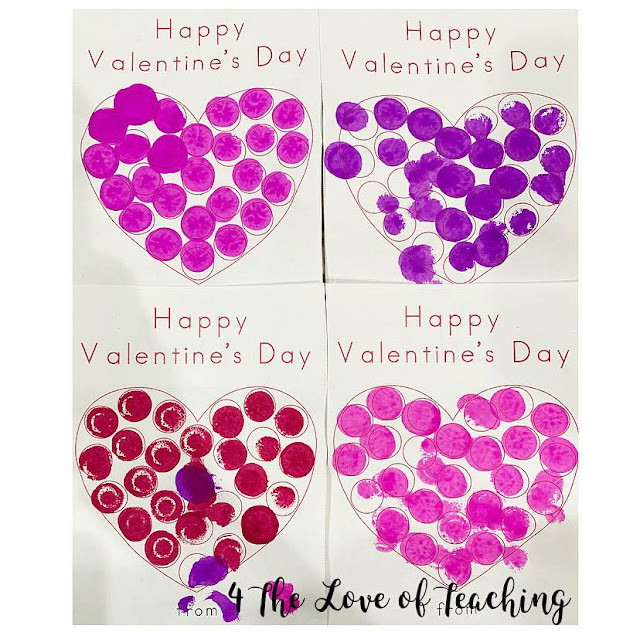 Today I am sharing a Valentine's canvas fingerprint painting that my kiddos did earlier in the month. 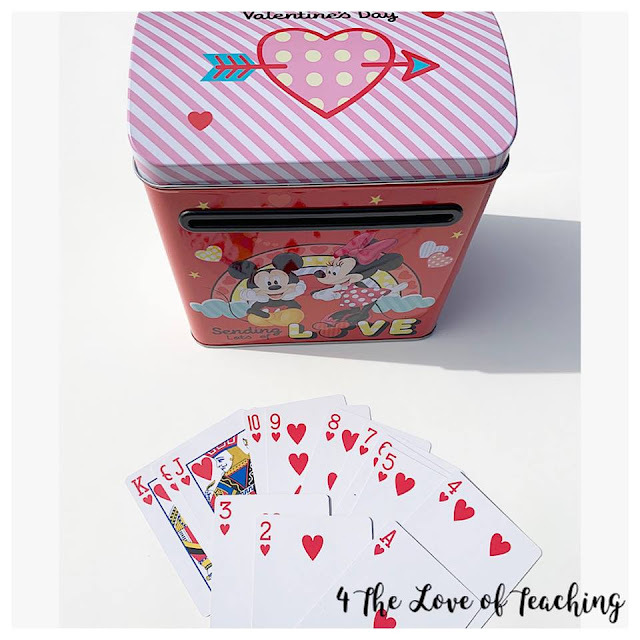 I planned it Valentine's themed and loved it so much that it is now part of our playroom decor! First, I printed a heart and used painters tape to place it in the middle of our canvas. Next, I had my kiddos take turns painting fingerprints all around. This project took several hours since we had to let the paint dry after each kiddo took a turn (to keep the mess contained!). It turned out so cute and is the perfect decor for a playroom or a bedroom! 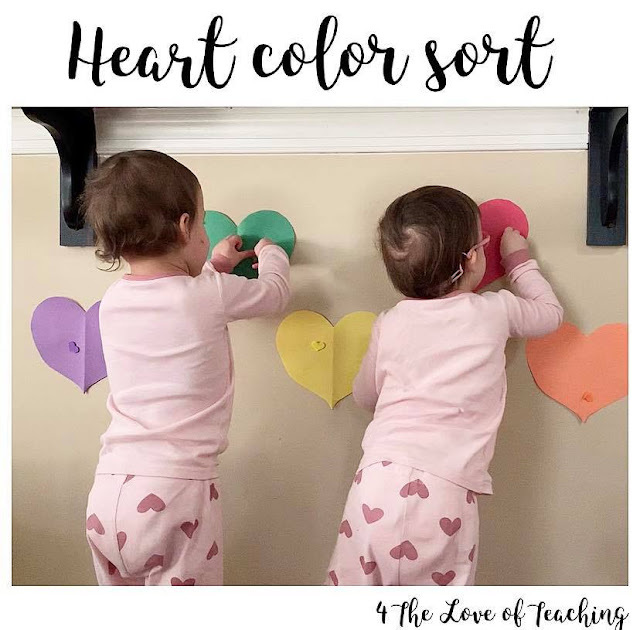 We have been working hard on sorting by color, so I wanted to share a few of the ways I've used the materials from our Valentine's Day fun for sorting. I purchased this set of multi colored hearts on Amazon and I found the printable at Teaching 2 and 3 Year Olds. For this activity we didn't use them as stickers. We just placed them onto the correct heart. 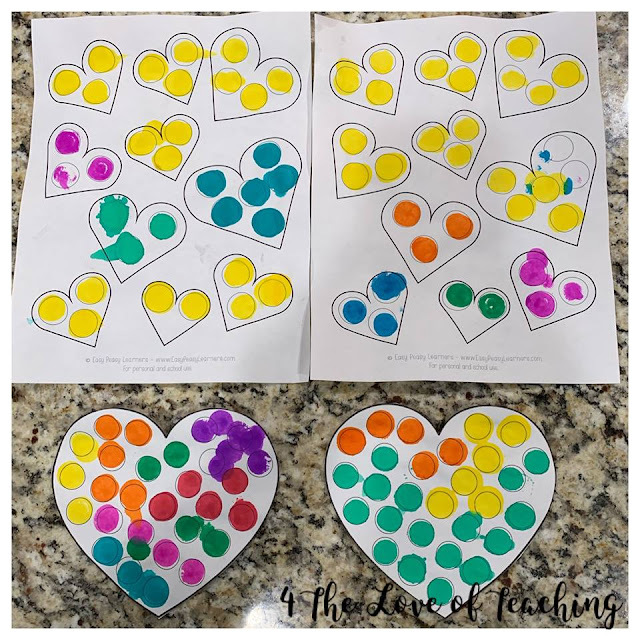 We will use the hearts as stickers in the next activity. 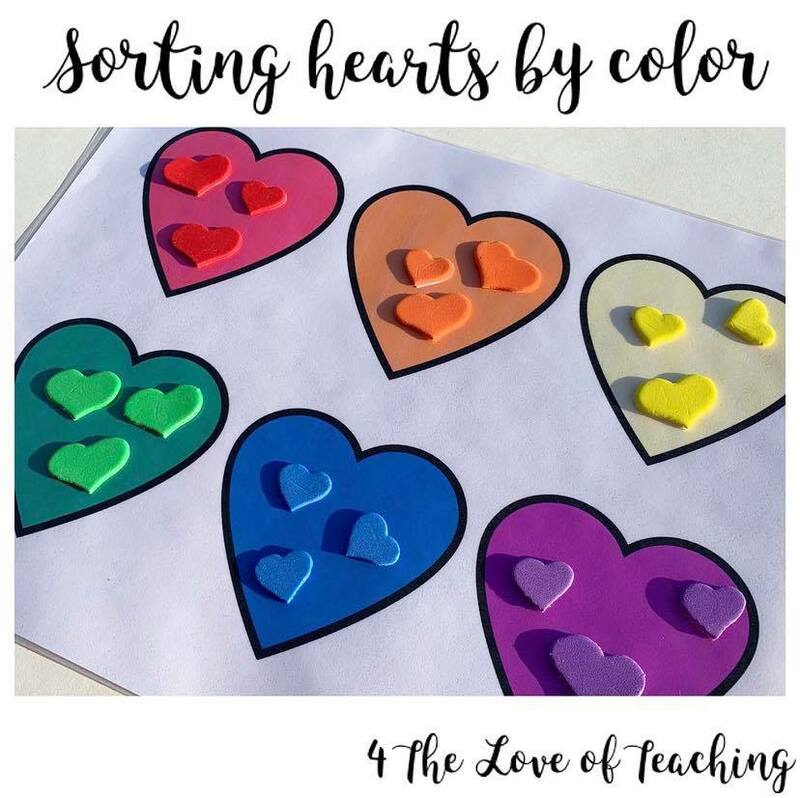 We used those same foam hearts for another color sorting activity! This time I cut out hearts from construction paper and taped them to the wall. We used the stickers to match to the colored heart. I purchased these red and pink plastic hearts from Dollar Tree and we have used them in both sensory bins this month. For this activity, I gathered them and we sorted them by color. Another easy color sorting activity you can do is to sort candy conversation hearts! 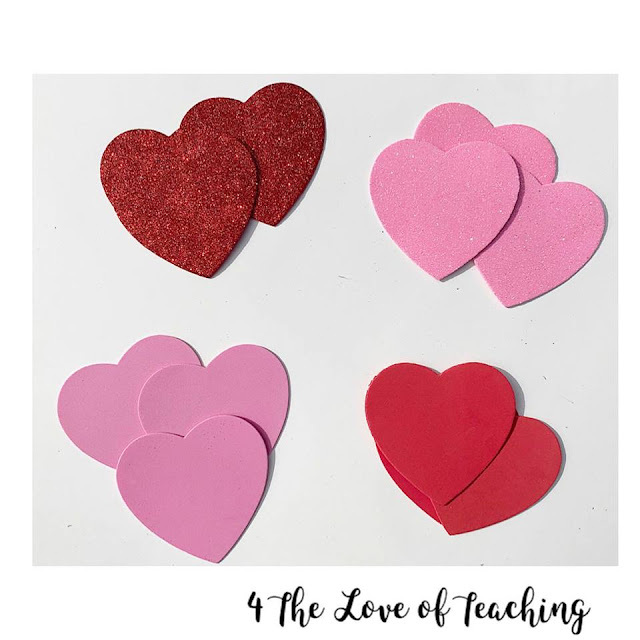 They are a classic Valentine's treat! 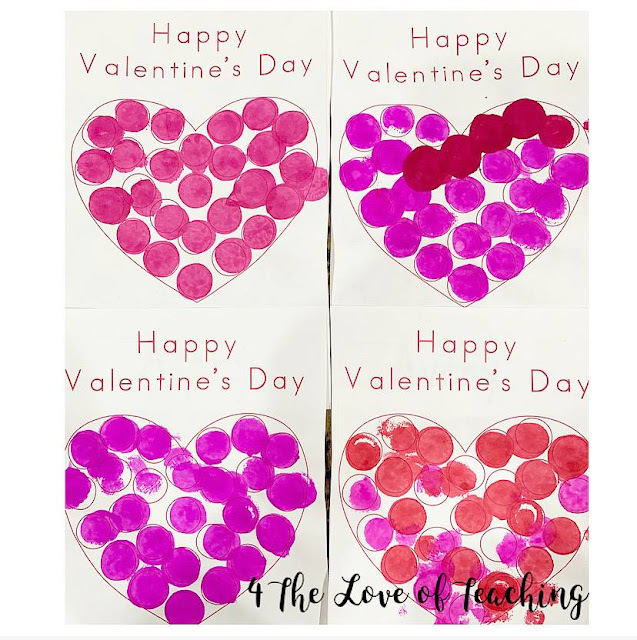 We recently did a Valentine's Day themed craft that I thought I'd share today with you. We now have it displayed in our playroom for decorations and my littles love seeing something they made hanging up! 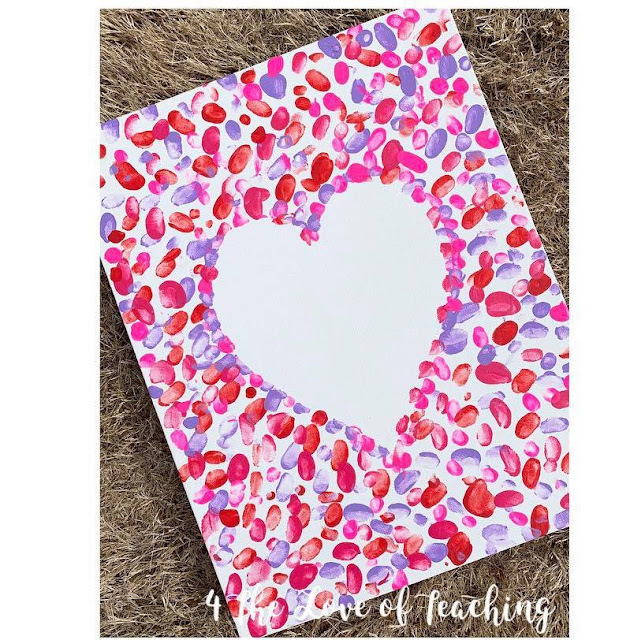 The printable came from Learning With Letty on TPT and can be found here. I used leftover scrap paper to cut out random pieces of paper in red, pink, and purple. It's really a simple and easy craft for Valentine's Day! Let's look at another Valentine's math activity for toddlers and preschoolers! I created this using PowerPoint, but I highly suggest purchasing a heart die cut because cutting these out (times two so both my girls could play it at the same time!) was a bit of a pain! 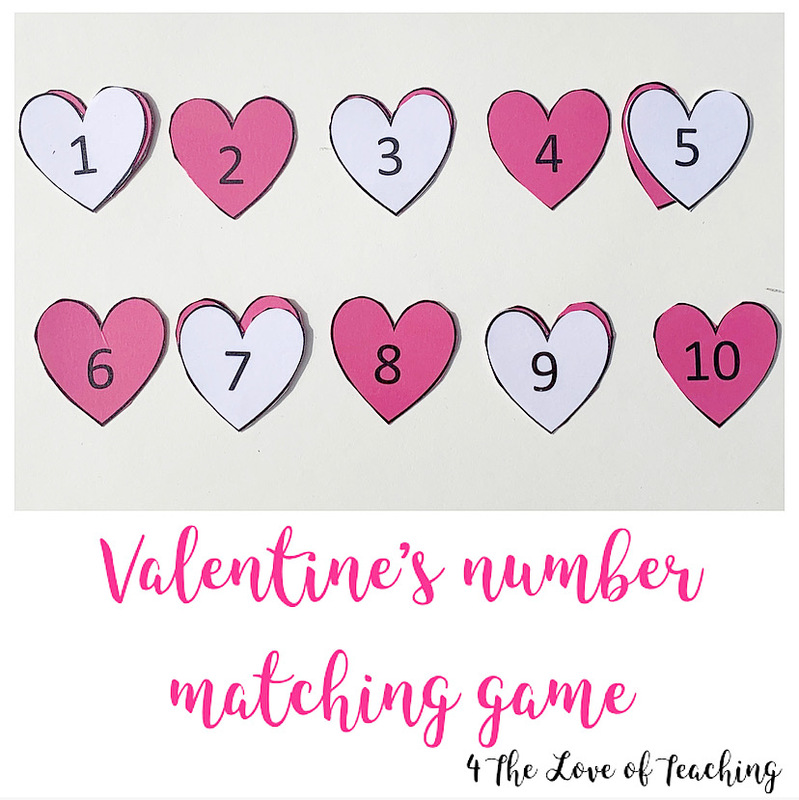 This is a simple number matching game that works on number identification! I chose to use different colored hearts to make matching a bit easier! 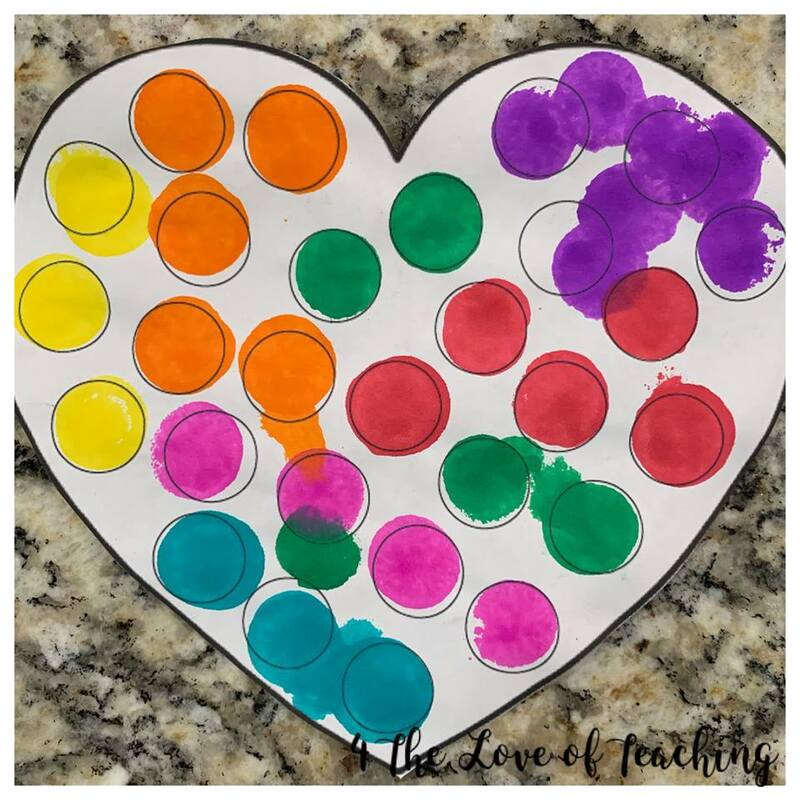 You could start with either color as the base and then have your child match the numbered hearts with the other color. You can expand this lesson by having them line up the numbers in order of least to greatest, greatest to least, odd numbers, even numbers, etc. SO many ways to expand or you can simplify it as well! We aren't ready for those expansions yet, so we will just stick with identifying numbers and add the enrichment ideas next year! Happy Saturday! 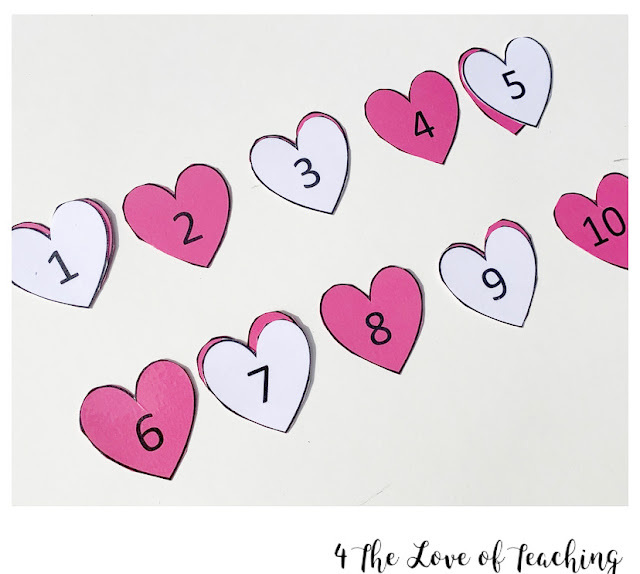 While my littles aren't quite ready for this activity, I wanted to share three Valentine's activities I did with my son when he was around 3 1/2 - 4 years old! 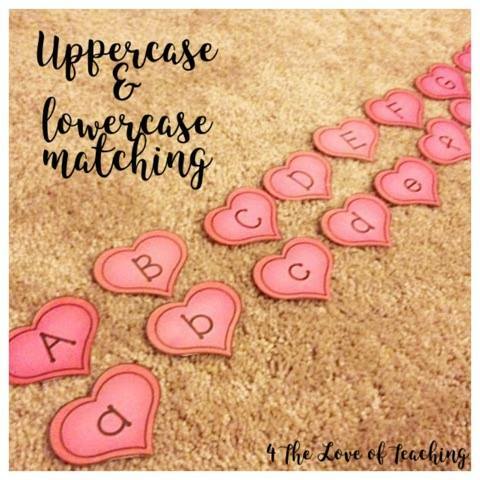 I printed uppercase and lowercase letters on hearts. First, we lined up the uppercase letters in order. Then he matched the lowercase letter to the uppercase letter. For this activity, we worked on finding the letter "V" within text! 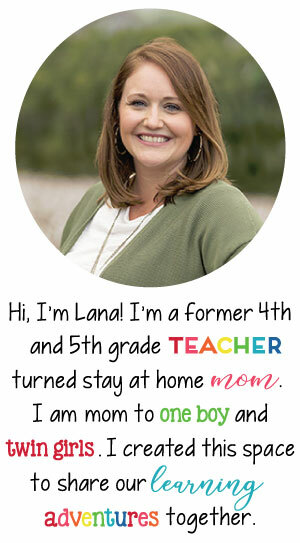 You can find this printable at Confessions of a Homeschooler. 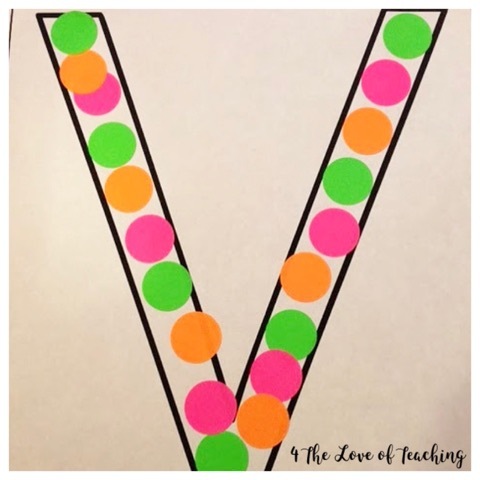 For this activity, we used dot stickers to form the letter "V" and did them in a pattern! Happy Friday! 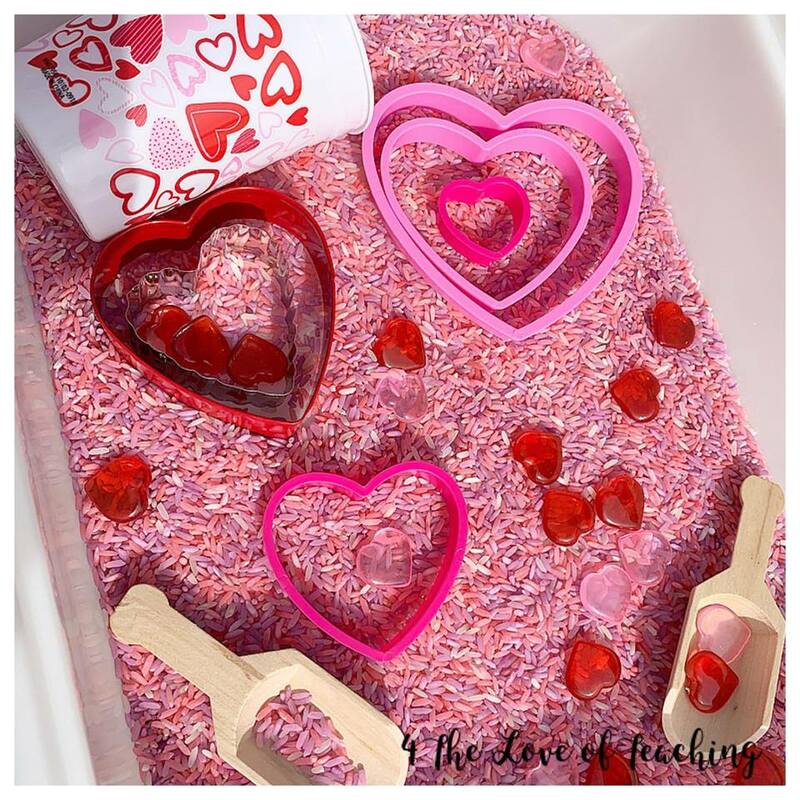 Today I am sharing a Valentine's themed Play-Doh set up that I quickly put together! To be honest, I haven't always loved Play-Doh, but it is SO good for fine motor skills so we pull it out fairly often for fine motor work! For this set up, I used some of the materials I had in sensory bins and pulled the rest from various places around the house (the play kitchen and a wooden peg set). ANY materials will work for Play-Doh and we will use some tools to help roll the Play-Doh out. 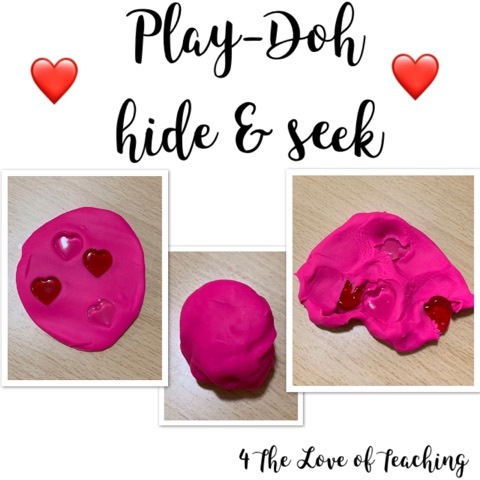 While the littles were playing with Play-Doh, I got the idea to take the mini hearts and "hide" them in the Play-Doh for them to find. 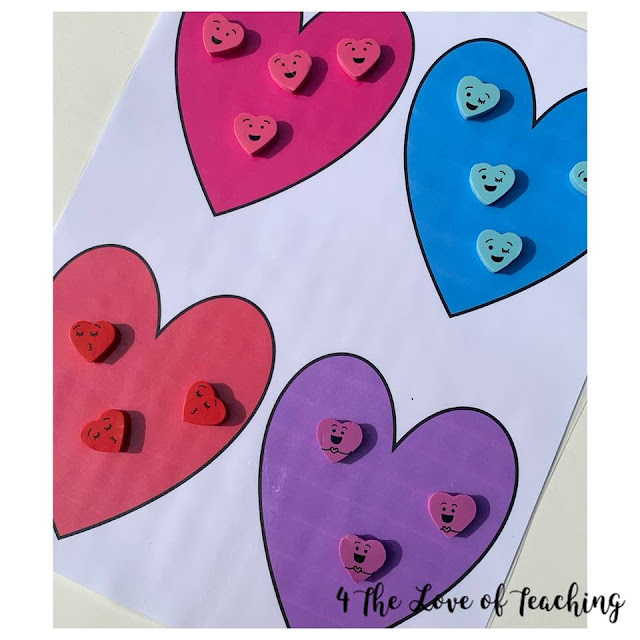 It was great fine motor practice since you can squeeze the Play-Doh to find the hearts OR pull it apart to find the hearts. Last week I shared this fun Valentine's Day sensory bin with you that involved dyed rice, heart shaped cookie cutters, scoops, cups, etc. Not all of our sensory bins take a lot of time to set up, some are just simple and thrown together in minutes - like this one below! I used a lot of the same materials here from the first sensory bin. I created two of these bins in a clear plastic container so they are easy to pull out, grab and go, or simple to keep on the shelf for this month. This bin can be thrown together literally in a few minutes and you're done! 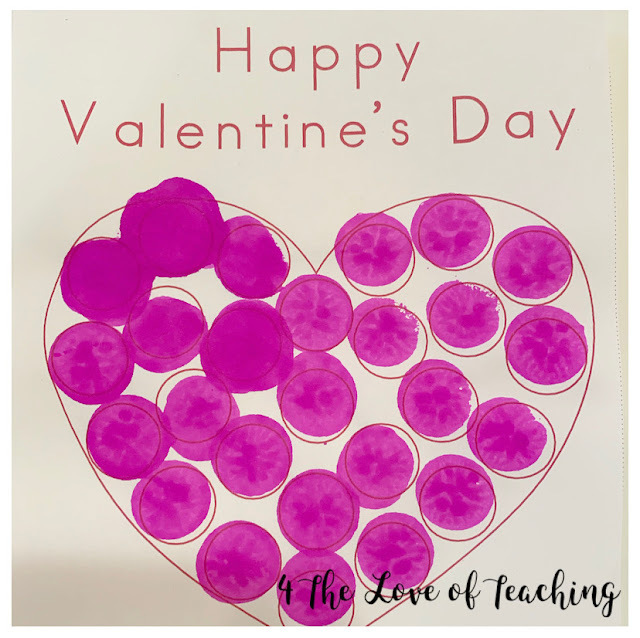 Valentine's conversation hearts have so many uses this time of year. We have used them in multiple ways over the years. 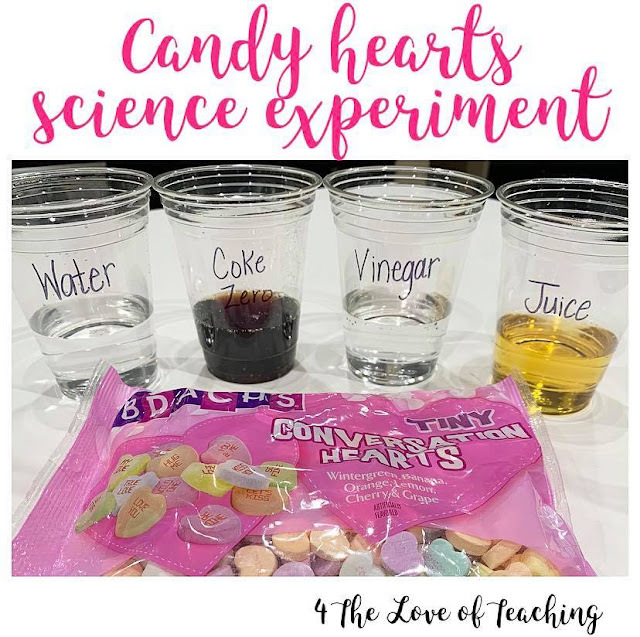 This year we tried a candy hearts science experiment! 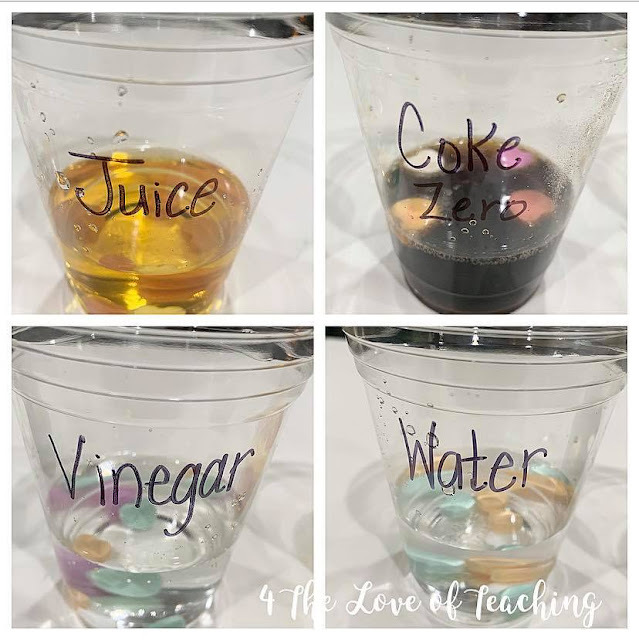 For our liquids we used things we already had at home: water, Coke Zero, vinegar, and apple juice. 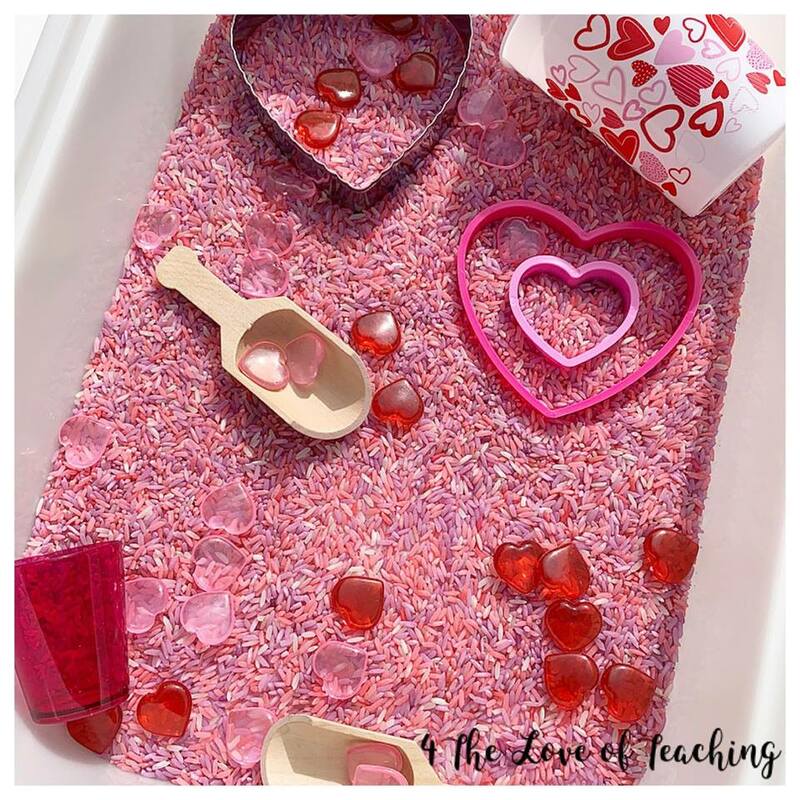 Before we started, I asked the question, "Which liquid do you think will dissolve the candy heart the quickest?" We placed 5 conversation hearts in each cup and observed what happened immediately and over time. Immediately we noticed that the hearts sank in every substance, except the Coke Zero (actually 1 sank, 4 floated). They started fizzing in Coke Zero immediately. We checked the conversation hearts after one hour and again after two hours. Most had risen by that point! 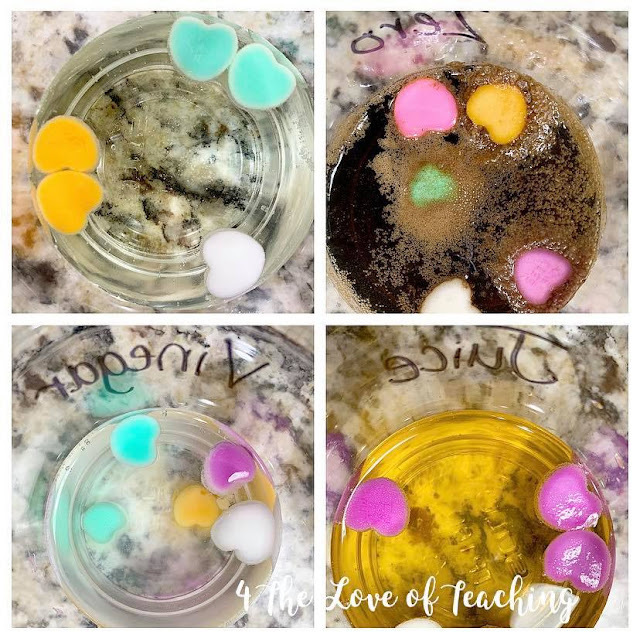 Such a fun way to discuss solubility! There's lots of printables online you can find to do this in your classroom and we could have used one at home. I chose not to for this activity since it was just me and my son doing it. We just talked about what we were observing throughout the process instead! One of my girls VERY favorite things to do is Do-a-Dots! It's so good for visual scanning and fine motor skills, so it's usually a weekly thing around here. I bought Minnie Mouse Valentine's cards for my girls, but I thought these DIY Do-a-Dot cards would be perfect for them to use! 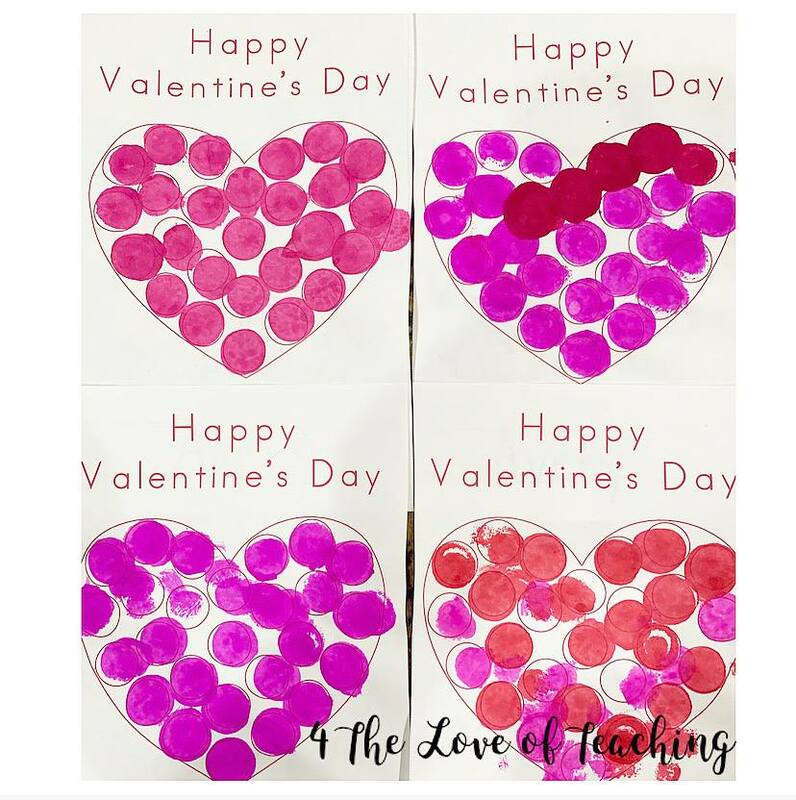 These make the sweetest homemade Valentine's cards! 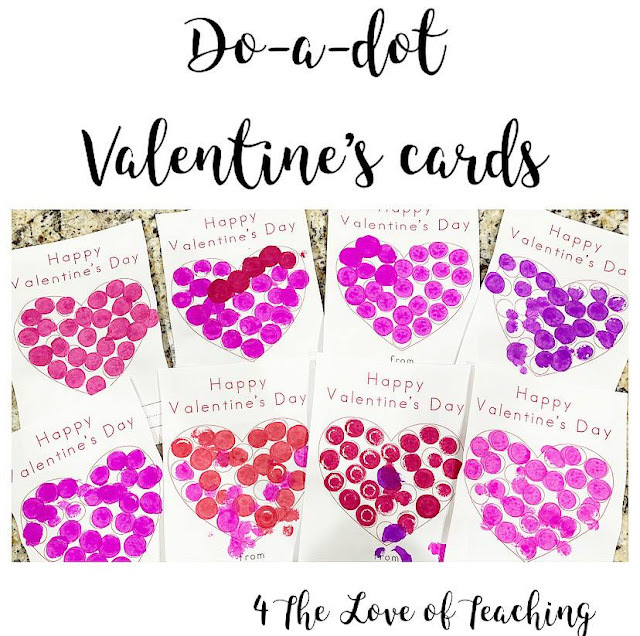 I also printed a few other Valentine's themed sheets for more Do-a-Dot fun! You can find them from Easy Peasy Learners here and iHeart Crafty Things here. I love how bright and colorful these are. They are perfect to display on the refrigerator this month! 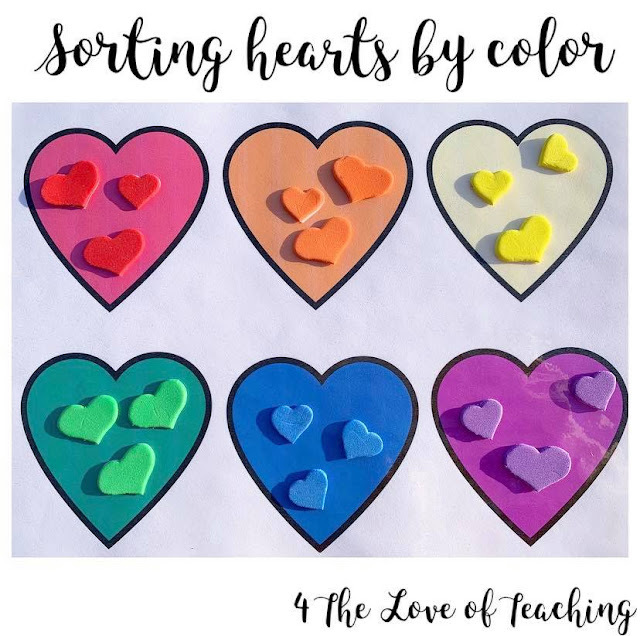 Today we are working on a math sorting activity using miniature heart erasers! This sorting activity can be expanded to counting as well! For this activity, we will match the mini erasers to the colored hearts! 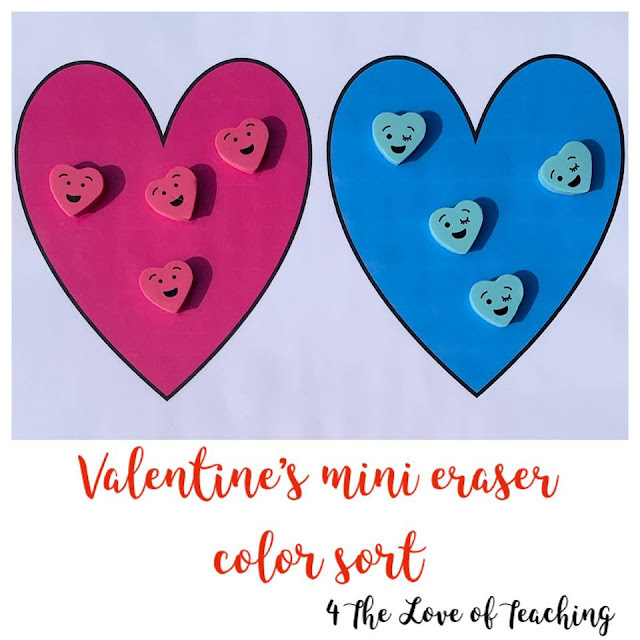 You canuse these erasers for so many math skills: sorting, counting, patterns, etc. 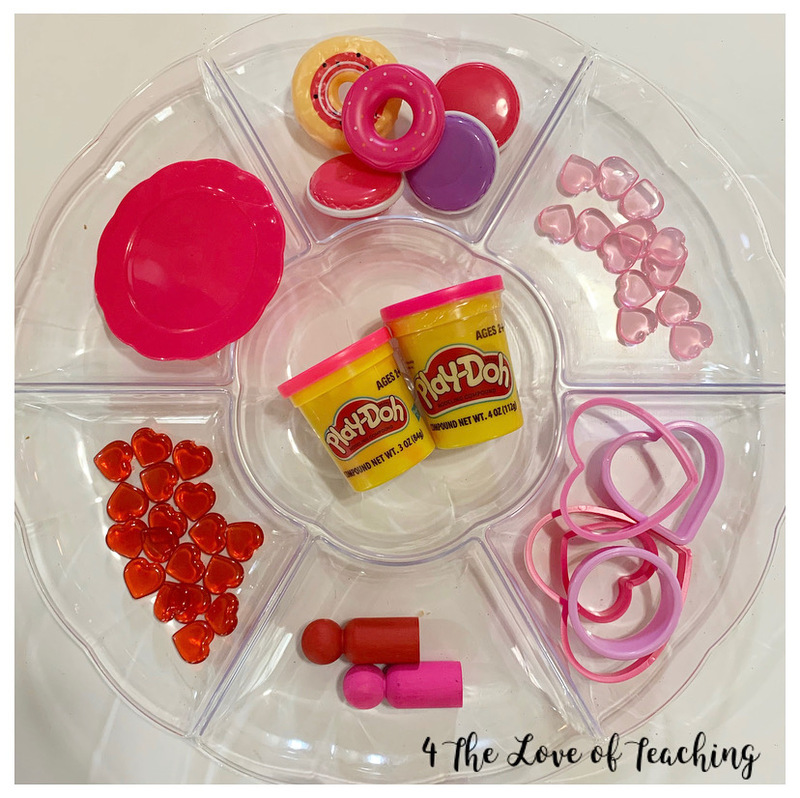 So many ways to expand this activity based on your child's level and interests! Today I'm sharing a quick and simple Valentine's themed multiplication review! 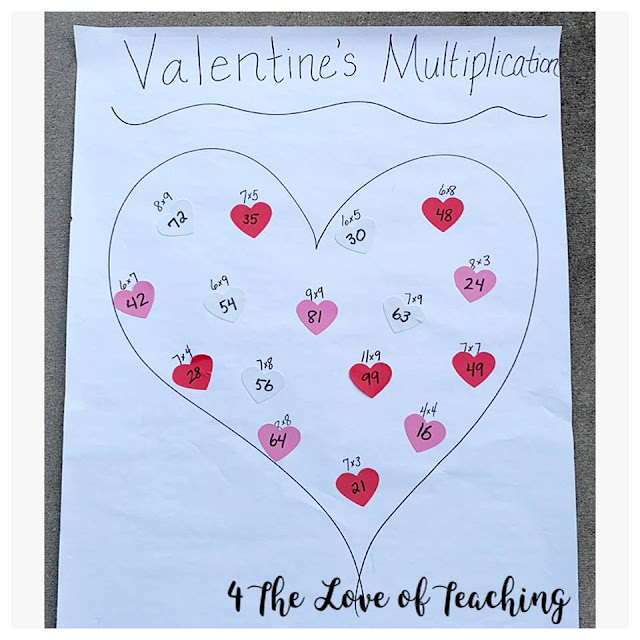 My third grader has learned all of his multiplication basic facts and is currently working on multi-digit multiplication, BUT I think it's always a good idea to review basic multiplication facts for complete mastery. I also think it's important for children to know these facts like the back of their hand. 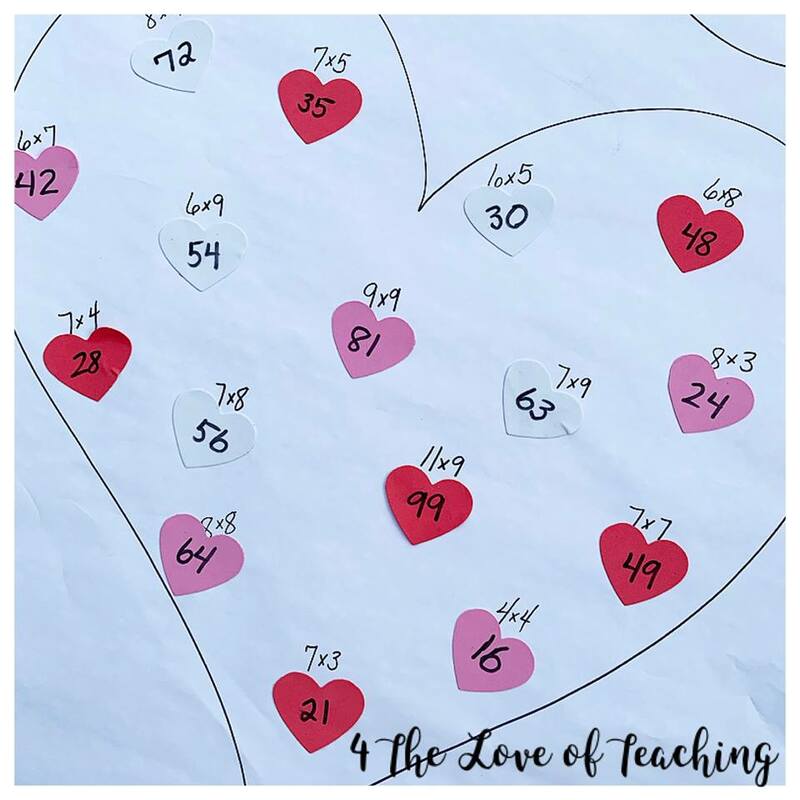 I think most children enjoy themes, so I decided to create this multiplication review. It took less than 10 minutes to create and it was a quick, fun way to have him review some of their harder facts. You'll notice that I did several from 7s, 8s, and 9s. He knew them all right off, which was great! Next time I could add some 12s facts for more of a challenge. Clearly drawing hearts that are perfectly equal on each side isn't my strongest suit, but it works! You could do an activity like this with almost any topic or subject. Parts of speech, addition/subtraction/division facts, vocabulary (maybe have definitions written down on the paper and the word on the heart), etc. Today's activity is a wonderful fine motor activity that I got from @ot_mama_of_twins on Instagram. I thought it was such a good idea that we had to replicate it! I chose Mickey Mouse themed since my girls love Mickey Mouse! 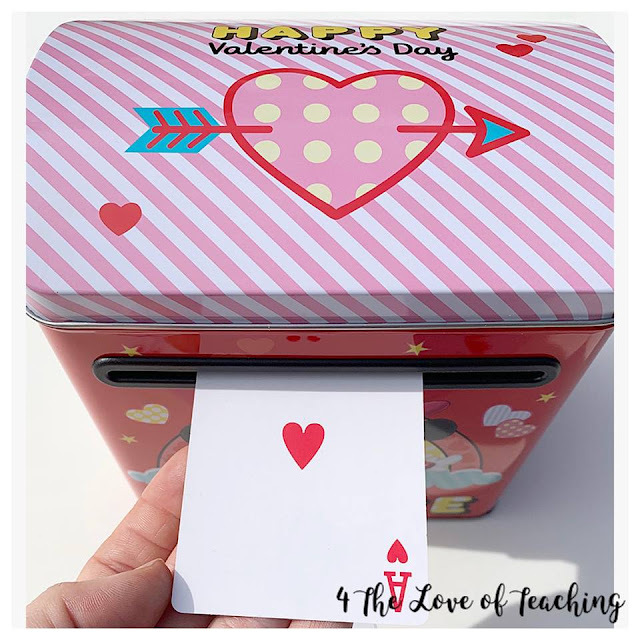 The goal is for children to use their fine motor skills to place the card into the mailbox! Some mailboxes had a slit in the top and some on the side, as shown below. This could be modified by placing the mailbox so the slit it upwards facing, but I love the challenge thrown in with it being on the front side of the mailbox! Happy February! 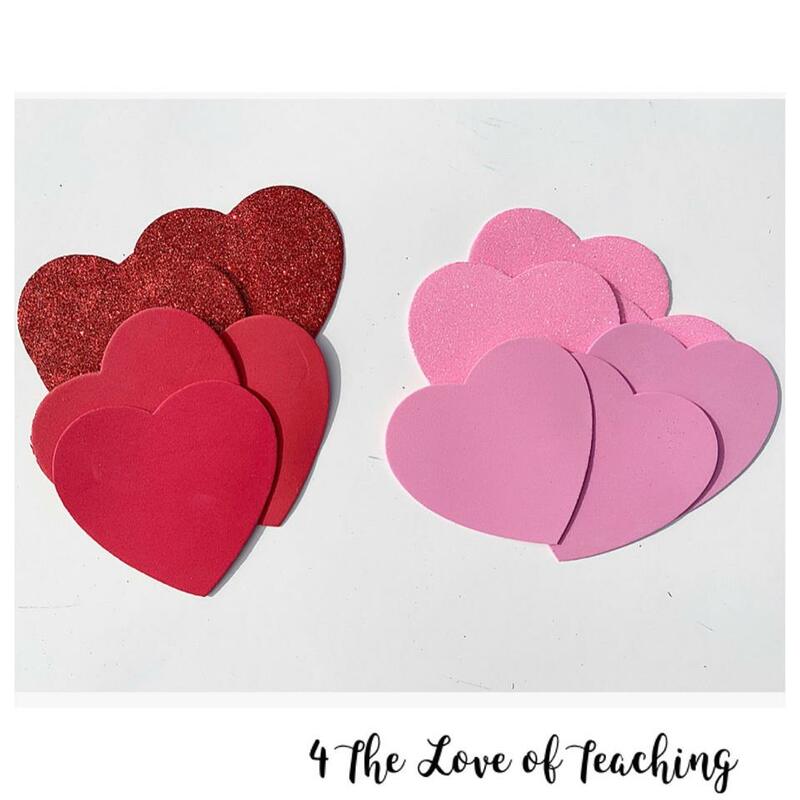 This month I am planning to share 14 days of Valentine's fun for toddler and elementary aged children! 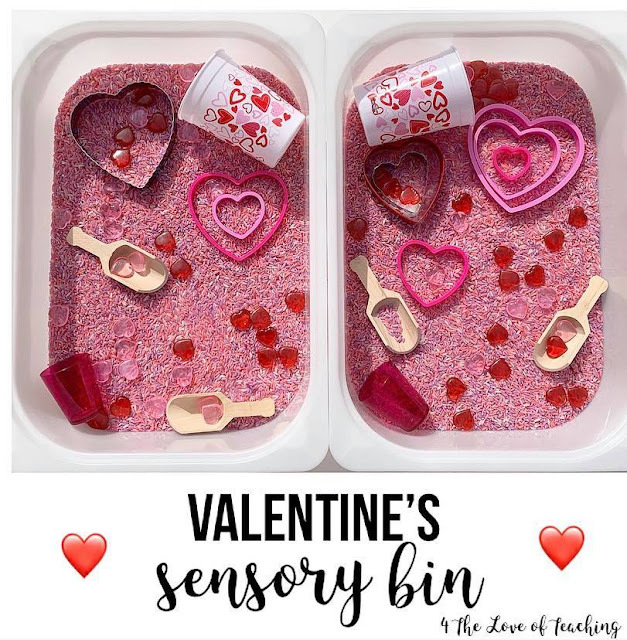 First, I am sharing our Valentine's themed sensory bin for the month! 1. Place 1 cup of rice in a gallon sized Ziploc bag. 2. Pour 1 tablespoon of white vinegar. 3. Add food coloring of your choice. 4. Close the bag and shake so all pieces are rice are colored. 5. Spread on parchment paper to allow it to dry. This usually takes about 5 minutes. It's that EASY and you can save it for years to come! This sensory bin has been a HIT already! I put it out a little early and my girls have played with it every single day! 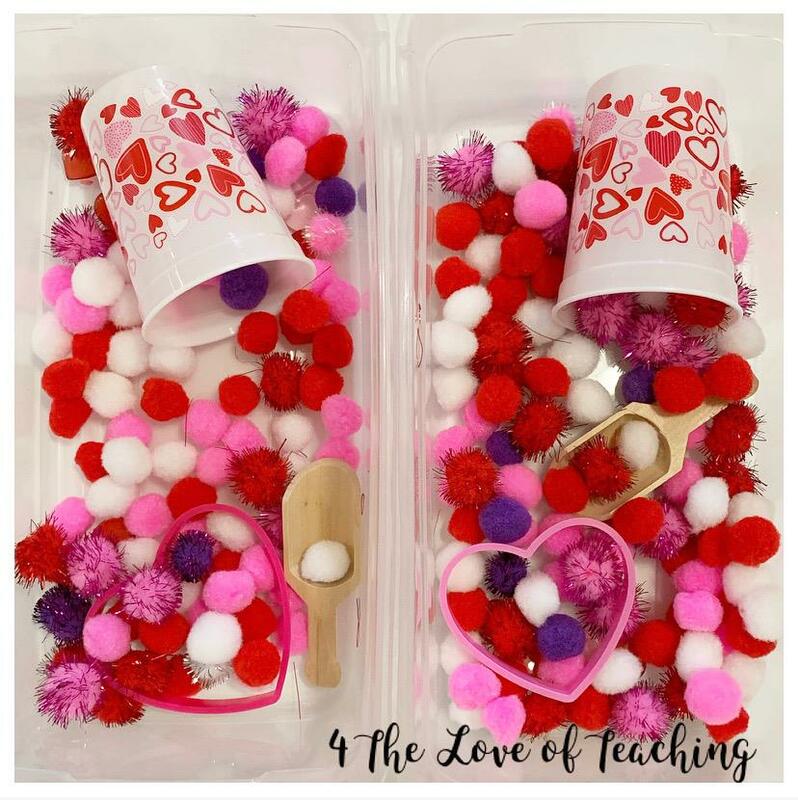 They love to scoop and pour, so the wooden scoops and plastic cups have definitely been their favorite so far! 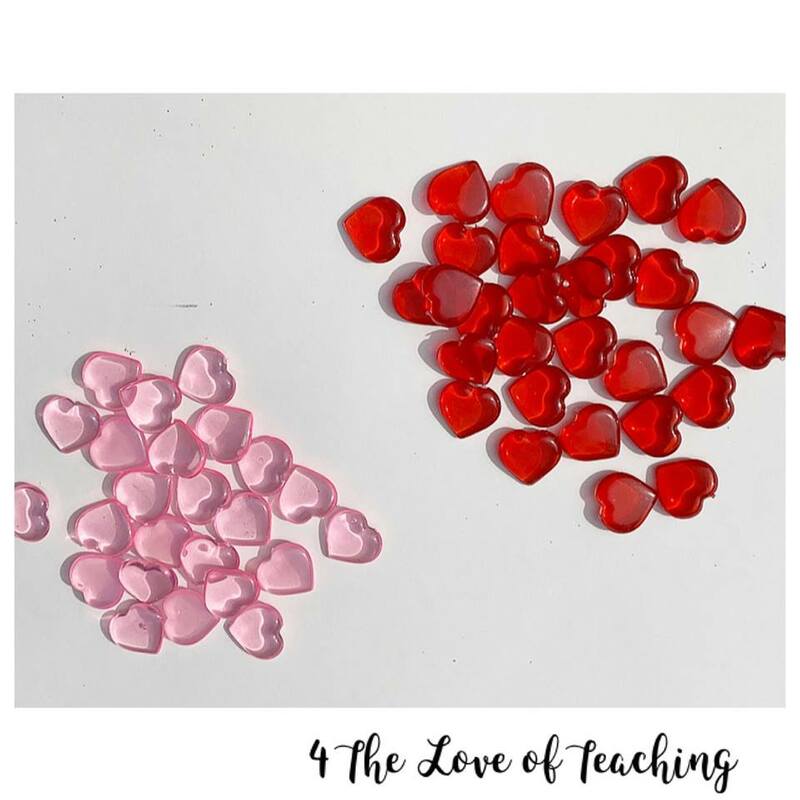 © 2018 For the Love of Teaching. Justine Template designed by Georgia Lou Studios. Customized by Albemarle PR. All rights reserved.